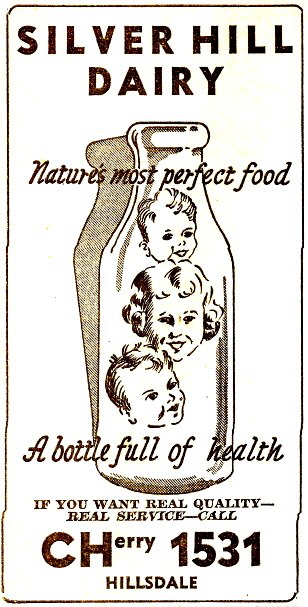 Steigerwald Dairy Company in the “Milk Bottle” building at 37th and Sandy specialized in milk for babies. Late in the nineteenth century, the rolling hillsides of southwest Portland between Hillsdale and Beaverton were dotted with dairies largely operated by Swiss immigrants. One of Portland’s earliest dairy farms was started by Melchoir (Mike) and John Raz, who left Switzerland in 1885. They established the Raz Brothers Dairy on a 93-acre tract in Hillsdale and over the next decade, their brothers Henry (younger) and Kaspar (older) immigrated to America to join them as did their six sisters. Around 1900, they renamed their dairy the Fulton Park Dairy. In 1908, the Raz Brothers sold Fulton Park Dairy and their 75 cows to Gustav Wardin who had married Elizabeth Raz, the daughter of Kaspar Raz. 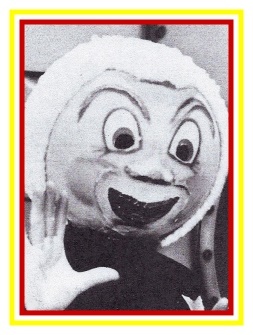 Ad from Portland phone book. In 1951, the Wardins sold Fulton Park Dairy’s cows and equipment to Alpenrose Dairy. In 1949 and 1953, part of the land where the Fulton Park Dairy sat was sold to the Multnomah County School District. Woodrow Wilson High School and Mary Rieke School were erected on this land. About the same time, the Wardins sold another parcel of land in Hillsdale where the shopping center was built. Early view of Mayflower Dairy in Hillsdale. Mayflower Dairy was established by John and Jenne Denley on Slavin Road (later Capitol Highway) on land they purchased in 1907 that was part of the original Tice Donation Land Claim. With their son Will, they operated Mayflower Dairy with a herd of 100 cows. Fruitiger Dairy, later Silver Hill Dairy, was established at what is now 45th and Vermont Street (formerly Hoffman Road) on land leased from the Raz family. This land is the present-day site of the Mittleman Jewish Community Center. John P. Hoffman built Hoffman Dairy at 55th and Hoffman Road (now Vermont Street). Multnomah Dairy was established about 1900 by Henry and Anna Tannler near 40th and Hoffman Road (now Vermont Street). Gabriel Park was later built on a portion of their property. Early view of a delivery wagon for Pleasant View Farms which was located at 5215 SW Dosch Rd. A typical milk delivery wagon carried twelve or more 3-gallon milk cans to Portland seven days a week. The driver carried a tin measure marked in 1-pint, 1-quart and 2-quart capacities. Customers provided their own container for the milk. Alpenrose Dairy near southwest 45th and Vermont streets in 1917 is one of Portland’s oldest dairies and it was operated by Henry and Rosina Cadonau. Henry was the son of Florian Cadonau, who in 1891, began delivering milk in three-gallon cans by horse-drawn wagon to a restaurant in downtown Portland. A fire destroyed the dairy in 1943 and a year later, the family purchased the 52-acre Elco Dairy on Shattuck Road which is the present site of Alpenrose. On Portland’s mostly rural eastside, a number of dairies sprang up as well. Portland’s rolling landscape, as well as an abundance of lush pastureland and the moderate climate, are all ideal conditions for raising milk cows and they contributed to the success of the local dairy farmers and the milk companies. 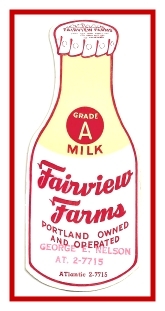 One of Portland’s early dairies supplied milk, ice cream and other dairy products to Portlanders for about 50 years. In an ad from Dec. 1922, it was listed as Portland Damascus Milk Company on Cornell and Brook streets in downtown Portland. In the 1930 Portland telephone directory, it is listed as Damascus Creamery. In the 1934 and 1941 telephone directories it is listed as Riverview Damascus Milk Company at 3342 SE Morrison Street. In the 1950s and 60s, it was known as Damascus Carnation Milk Co. The Steigerwald Dairy Farm was located between northeast Prescott and Killingsworth Streets from about 42nd to 52nd, near Going Street. Alvin Steigerwald operated Steigerwald Dairy Company, one of the earliest dairies in East Portland. In addition to selling milk and creamery products, the Steigerwalds also raised nursery stock. At your service! Charles H. Derrie delivered products from the Hazelwood Cream Company. In 1900, the Hazelwood Cream Company was established in Portland at Front and Ankeny Streets. They manufactured and distributed the highest quality butter, eggs, cheese, milk fed poultry, ice cream and condensed milk. Over the years, there were four Hazelwood Confectioneries that operated from 1908 until about 1931. The Hazelwood, when it was owned by Hoffman Dairy Farm, had an ice cream parlor and Confectionery at Multnomah Falls. For a time, The Hazelwood Company operated a Candy Kitchen. View of a Mt. Hood Cream Co. delivery wagon. The Mt. Hood Creamery was located at 230 East Sixth St. Early view of a Portland Milk Company delivery wagon. Over 100 Dairy Farms and Milk Companies have come and gone in the Portland area and several are still in operation. One of the earliest, Alpenrose, has fifth generation Cadonaus, Carl III and Tracy, working in the family business. Darigold - Dairy Co-op Assn., (formerly Mayflower Farms) which started in the 1920s, is still operating by the Ross Island Bridge. Mt. 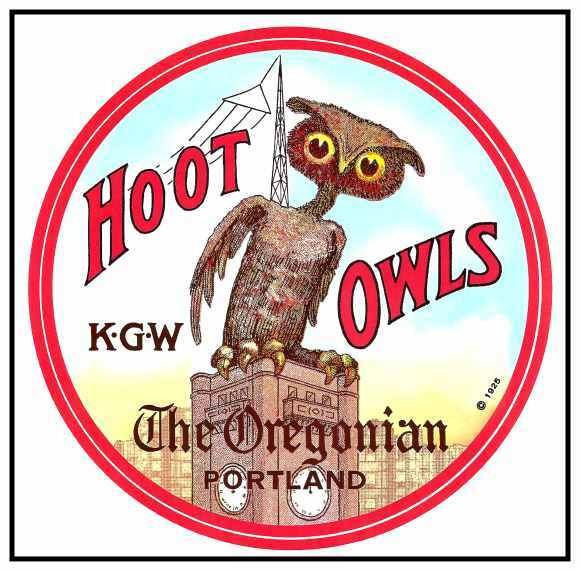 Hood Ice Cream Co. was at 230 East Sixth St., Picnic Park Dairy was on Columbia Slough Rd., Multnomah Creamery was at 501 NE Alberta St., Pleasant View Farms was located at 5215 SW Dosch Rd., Raven Dairy at 165 Fourth St., Rose Park Dairy was in Fairview, Sandy Dairy with a creamery in Sandy, Oregon had a dairy at 7410 SE Foster Rd, Snowflake Dairy Farm was on Rockwood Rd., Short Horn Dairy was on Scholls Ferry Rd., Snow Cap Dairy was at 1857 E Glisan, Springbrook Dairy at 1499 E Burnside, Standard Dairy was at 2808 NE Union, Sunny Brook Farms Dairy was at 2424 SE 37th, U.S. Dairy was at 1995 E Glisan St., Walnut Park Dairy was at 2205 NE Columbia Blvd., and who could forget Foremost near 80th and Halsey? Many dairy companies merged or moved to different locations over the years. Portland updated its addresses and street names in 1932 and some of the above addresses refer to the old address prior to 1932. Hillsdale and Multnomah had up to 17 dairies including: Capitol Hill Dairy, City View Dairy, Edelweiss Dairy, Fulton Park Dairy, Hill Farm Dairy, Multnomah Dairy, Shattuck Dairy and Silver Hill Dairy. Carnation Dairy Products had seven plants in Portland: Portland Damascus Milk Co., Riverview Dairy, Fernwood Dairy, Holbrook Dairy, Steigerwald Dairy, Vine Lodge Dairy and Oregon Creamery Co. Boring had two prominent dairies: Meier & Sons and Arnold Moore & Son. 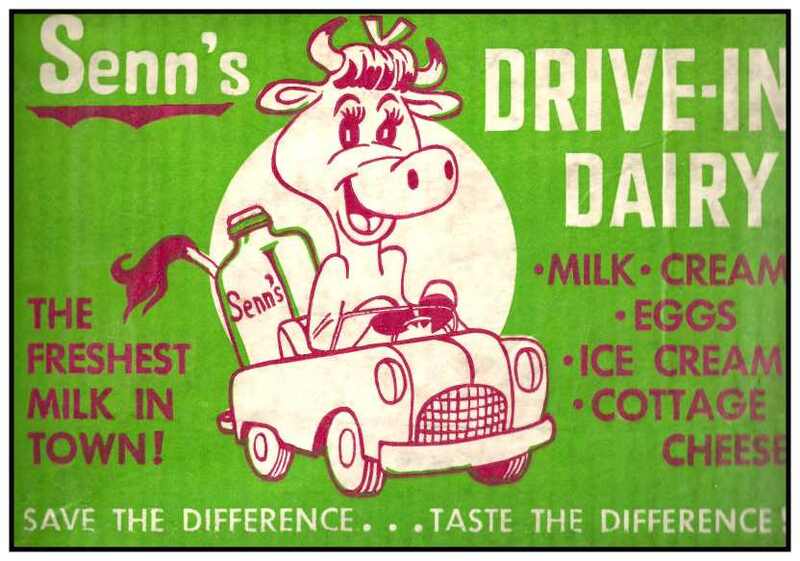 In Milwaukie, Hager’s Pure Milk was located at 2743 Washington St.
Senn’s Drive-in Dairies had several locations around town and Senn’s Dairy Park now occupies their location at 112th & NE Prescott Street. 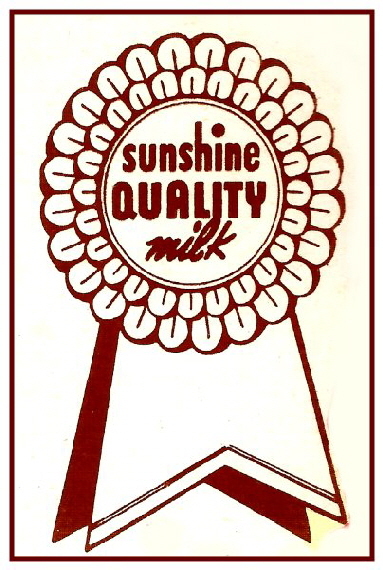 Sunshine Dairy, a fourth-generation family-owned milk processor which started in 1936, is still in operation at NE 21st and Oregon Street.